When was the last time you checked to see if your immune system is up to date? 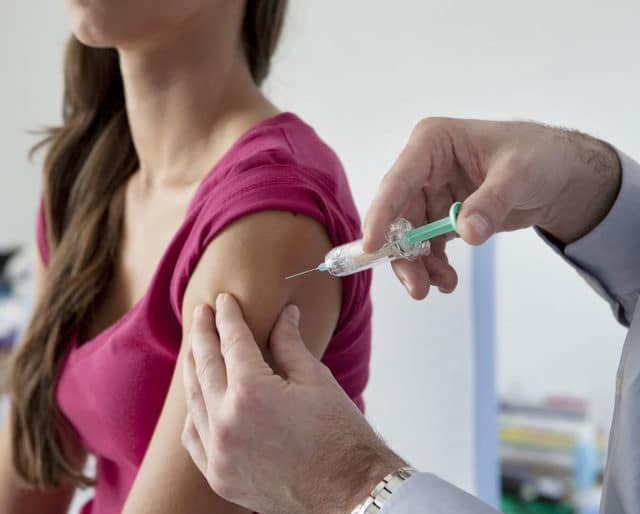 This August, National Immunization Awareness Month raises awareness and encourages everyone to make sure they are current on the necessary vaccinations for potentially harmful diseases. Many diseases can be easily prevented by administering vaccines, and thus, protecting you from unseen viruses. Take the necessary precautions with a simple call to your doctor, and avoid potential harm while leading a healthy, happy life. Prior to the introduction of the vaccine in 1995, there were around 4 million cases per year in the United States. Ten years after the vaccine was recommended in the US, the CDC reported as much as a 90% drop in chickenpox cases. One dose of the vaccine prevents 95% of moderate disease and 100% of severe disease. In 1958, there were 763,094 cases of measles in the United States. In 2008, there were 64 suspected cases of measles thanks to immunization from vaccines. Jonas Salk introduces the Salk vaccine, or inactivated poliovirus vaccine, to the world. With two doses of the vaccine, 90% or more of individuals develop protective antibody to all three serotypes of polio, and at least 99% are immune to polio following three doses. Edward Jenner develops and documents the first vaccine for smallpox. It's the first vaccine ever developed in history. The only way to be absolutely certain about what vaccinations you’ve received is to gather your medical records. Contact your doctor and request your immunization records to determine whether or not you are up to date. Just because you feel healthy doesn't mean you don't need to be vaccinated. Unlike most medicines, which treat or cure diseases, vaccines prevent them. When you check your immunization records, encourage friends to do the same, and you can all make sure you are up to date. A family medical history can reveal the history of disease in your family and help a doctor identify patterns that might be relevant to your own health. This will allow the doctor to be best informed about recommending vaccines for immunization. Though scientists didn’t yet understand what the smallpox virus was, it was widely believed that cowpox could be used to immunize against it. British scientist Edward Jenner’s research confirmed this and allowed him to develop the first smallpox vaccine in 1796 — an entire century before the virus was first officially discovered. For Maurice Hilleman, that includes more than half of the 14 routinely recommended childhood immunizations in the U.S., including vaccines against measles, mumps, and meningococcal disease. India and China are believed to be the first civilizations to inoculate their children against smallpox using a process called variolation. The process requires a small incision into a person's arm and then rubbing infected material (ground scabs or pus) into the wound. Meningitis A is an infection that can cause severe brain damage and is often fatal. The introduction of the Meningitis A vaccine in Africa in 2010 has all but eliminated the disease. Currently there has been a major push for clinical development of vaccines, and the first vaccine to protect children against malaria will be piloted in three African countries this year (2018). Vaccination protects children from serious illness and complications of many diseases, including amputation of an arm or leg, paralysis of limbs, hearing loss, convulsions, brain damage, and death. Vaccination is safe and effective. All vaccines undergo long and careful review by scientists, doctors, and the federal government to make sure they are safe. We all have a public health obligation to our communities to protect ourselves as well as others from potential health risks. By getting vaccinated, we eliminate diseases before they have a chance to spread.